Fingerprints taken from one of the suspected militants killed in Indonesia on Wednesday match those of bomb expert Azahari Husin, police have said. Earlier, Indonesian President Susilo Bambang Yudhoyono said he was "convinced" the dead man was Azahari. Azahari and two other men were killed after police surrounded their house in East Java. He was initially thought to have blown himself up, but national police chief General Sutanto told reporters on Thursday that Azahari was either shot during the raid or died when another militant detonated a homemade bomb. "Thirty wired explosives were found inside the house, which were possibly to be used to conduct bombings," Gen Sutanto said, according to the Detikcom online news service. He added that at least two backpacks believed to contain explosives were also found. Azahari's death came as Indonesian police said they had identified two of the three suicide bombers involved in the latest attack on Bali, on 1 October. Police only released the two men's initials - MS and MN - and said they came from Java Island. Bali police chief I Made Mangku Pastika said the authorities had known who the men were for a while, but had kept the information secret so they could track Azahari. Australian police commissioner Mick Keelty said that the identification of one of the bombers had led them to Azahari's hideout. He added that fragments of the bombs used in Bali on 1 October matched those found in the house where Azahari was killed. Azahari is believed to have built the bombs which killed more than 200 people - 88 of them Australians - on the tourist island. Australia, Malaysia and security experts welcomed the news of Azahari's death. 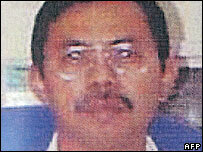 Known as "Demolition Man" in his native Malaysia, he is also suspected of masterminding other attacks. Along with fellow Malaysian, Noordin Mohammad Top, he is said to be a key member of the militant group Jemaah Islamiah (JI). Analysts say his death will deal a major blow to JI's network, but it is unlikely to completely destroy their ability to mount more attacks. The incident happened when police tried to raid a house in Batu, near the city of Malang in East Java on Wednesday. 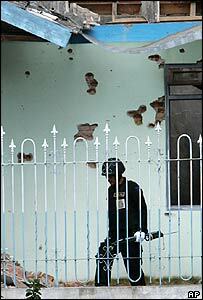 Three men were in the house and reportedly put up stiff resistance, throwing grenades at the police outside. They set off several explosions and fired at police. One police spokesman said the house had been under surveillance for the last 10 days after a tip-off from an arrested terrorist suspect. Azahari Husin, a trained engineer, once worked as a university lecturer in Malaysia and gained a doctorate in property valuation from the UK's University of Reading. A married father-of-two in his late 40s, he is said by some to have been a fanatic, ready to die for his cause. Azahari, and his alleged accomplice Noordin Mohammad Top - whose whereabouts are still unknown - have been on Indonesia's most wanted list for years, for a string of bomb attacks in the country. As well as being the suspected mastermind behind the Bali attacks, he and Noordin Mohammad Top were also wanted in connection with an attack on Jakarta's JW Marriott hotel in 2003, and one on the Australian embassy in 2004.